Summer hasn't come to an end just yet, so there’s still time to enjoy Polish summer dishes ‒ which differ from the richer wintertime specialties ‒ if you haven't done so already. You could, of course, try those Polish summertime dishes during winter to bring back some warm memories, but the odds are high that it just wouldn’t taste right. After all, much of the charm of those dishes relies on seasonal products, such as wild blueberries and rhubarb, that are best enjoyed fresh. 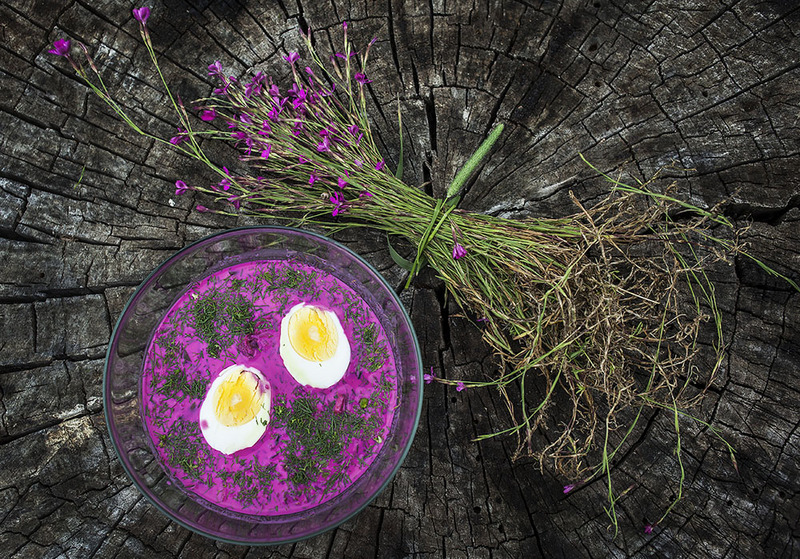 Chłodnik is a refreshing cold soup made from soured milk, young beet stems, cucumbers, thickened red beetroot juice, and lemon juice. It is seasoned with dill and chives and served with a peeled boiled egg cut in half. On a very warm day few dishes can match the appeal of a nice, chilled bowl of chłodnik. The trick is not to overboil the beet stems. The strips of the stems that are added to this thick soup should be pleasantly crunchy, just as the strips of fresh cucumbers that accompany them. Chłodnik not only is tasty but also has a beautiful fuchsia colour. Pierogi are probably Poland’s most famous and universal dumplings. They’re known across the world and can be stuffed with almost any ingredient. First they need to be boiled and can then be served as such or fried on the pan to make them crispy. Popular variations include white cheese and potato, and cabbage and mushrooms. Summertime pierogi are usually sweet, stuffed with fruit and served with cream. 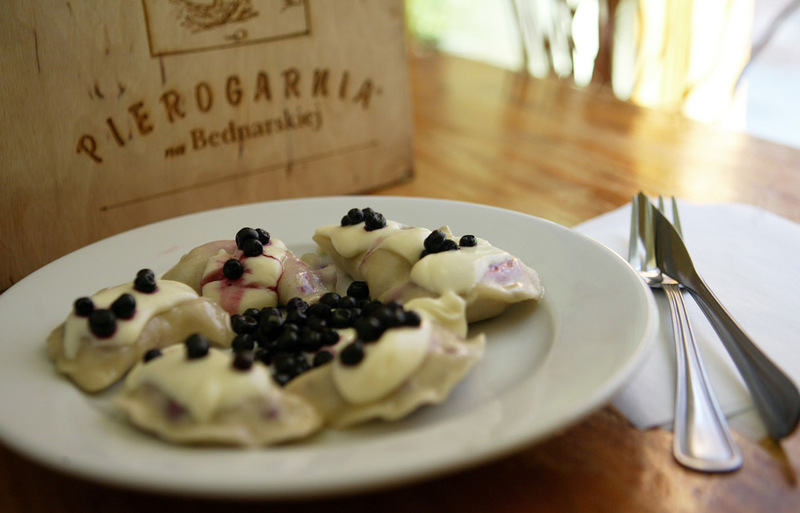 Pierogi with bilberries are a special treat, as these great-tasting fruit have to be hand-picked. Fruit pierogi are usually boiled rather than fried, although Polish restaurants are beginning to offer increasingly fanciful variations. This simplistic dish is much tastier than it sounds. It’s easy to prepare, making it perfect for those hot and lazy summer days when no one feels like spending a long time in the kitchen preparing a complicated meal. Sour milk with potatoes is also a light dish and therefore a good choice during heatwaves. 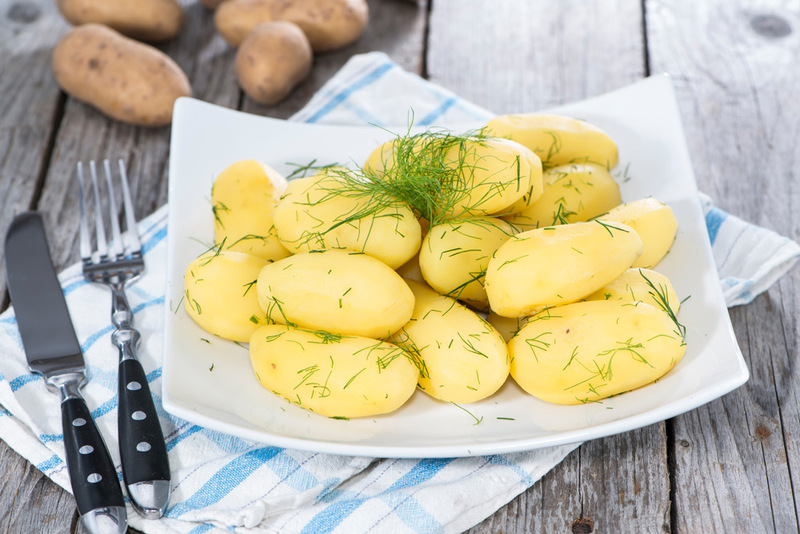 It consists of peeled, boiled potatoes with a bit of butter and salt. Season with dill and serve with a cold drink of sour milk (zsiadłe mleko). Believe it or not, that’s enough to make a delicious summer meal. One of the great things about fruit soup is that it offers a lot of freedom to the cook. Feel like a strawberry soup? Go for it. Fancy a cherry one? No problem. And no need to choose: you can mix various fruits together and make a multi-flavoured soup. Fruit soup can be served cold or hot, with or without noodles. Some people like theirs with puff pastry croutons. The only ingredients you need to make your own scrumptious fruit soup are sugar, sweet cream, water, a bit of flour and, of course, fruit. 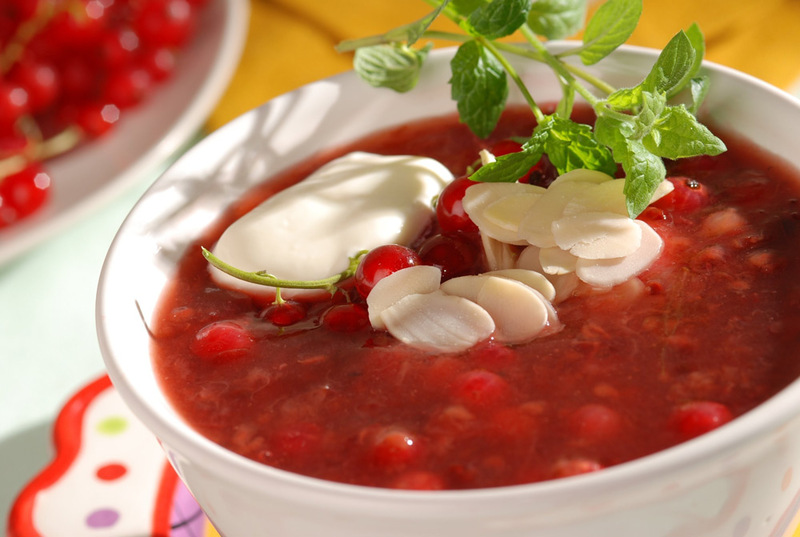 Popular choices of fruits for this soup include, on top of those mentioned above currants, raspberries and bilberries. Pasta with a red sauce and cheese rather sounds like the description of a popular Mediterranean dish. 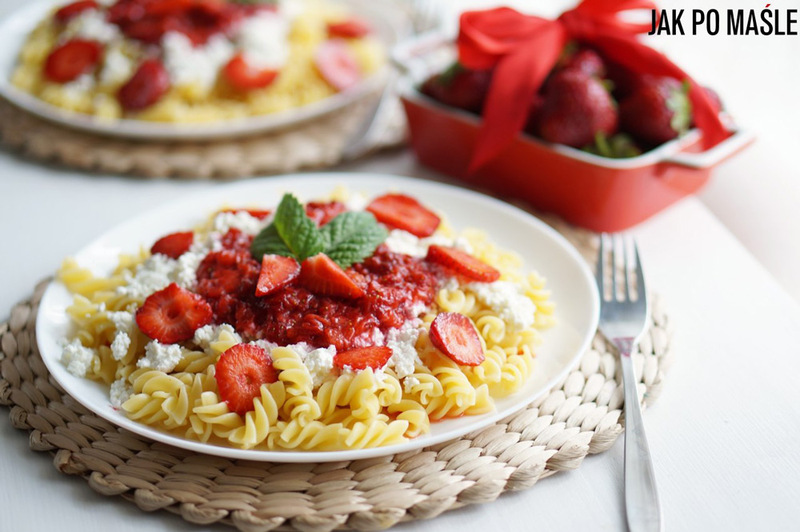 But it also describes noodles with strawberries and white cheese, a classic Polish summertime dish. It is usually made with short noodles, such as Fusilli. After being boiled in salted water the noodles are coated with a sauce made by pureeing strawberries with vanilla sugar. The composition is garnished with halved strawberries and small chunks of white cheese (quark). Even though rhubarb is a vegetable, and a rather tart one at that, it makes for a marvellous cake ingredient. Just make sure to tone down your rhubarb’s sourness a bit before you start making a cake with it. You can do that by placing slices of the rhubarb stems in a bowl and sprinkling them with sugar (the leaves are toxic and should be discarded). This will cause the sliced stems to let out juice, which you can strain away. With it your rhubarb will lose some of its tartness. Apart from the stems you’ll also need these ingredients to make the cake: butter, eggs, flour, fine-grained sugar and vanilla powder. 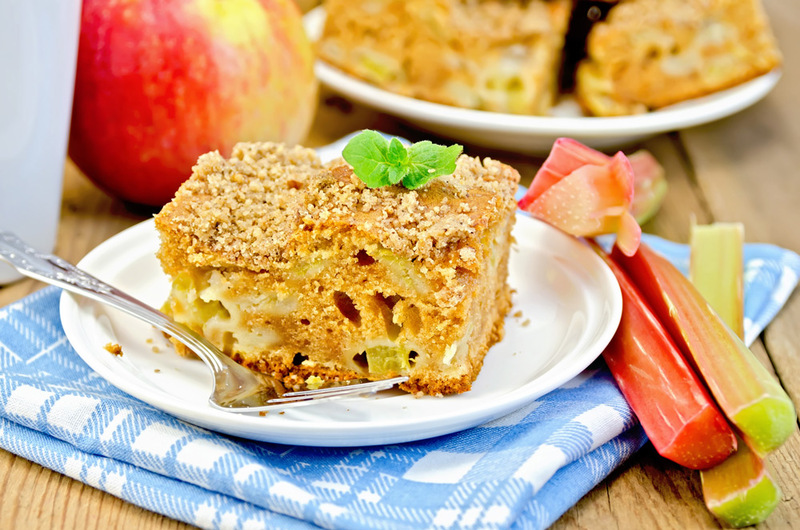 With its nice sweet and sour taste rhubarb cake is a great choice for a summer dessert dish.